Vol 5 which have been launched few hours ago. 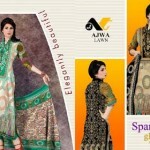 The collection has been launched to serve the mid-summer purpose of glorious lawn prints and elegant dress designs. The collection consists of some glorious, graceful and splendid dress designs embellished with stylish and colorful lawn prints. Elegantly beautiful dresses in A-Line, Neckline and border line style have been designed to please the girls with style and fashion. 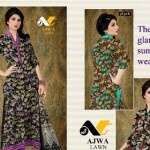 Hope you like the stunning, marvelous and glamorous summer dress designs of this Ajwa Lawn Collection 2014, vol-5.